The economy soft mesh safety vests with stripes aren’t coated with PVC, but they have reflective stripes that give you much better visibility. These vests are made from a soft mesh material, so they’re very comfortable to wear. Orange and lime are some of our most popular colors, but you can choose from several other colors. These economy mesh safety vests have 3M reflective silver or lime stripes, so you can choose the style that is most suitable for your specific needs. We even carry these vests with a double stripe combination. The vests are also very lightweight, so you won’t feel like you’re carrying around several extra pounds of equipment. With a one-size-fits-most design, these products have no trouble fitting an average adult. They even come with a built-in elastic side, which helps to give the wearer an even better fit. The Velcro® front closure further solidifies the perfect fit and can make you feel much more confident while working. If you’re looking to enhance visibility for an affordable price, these vests are some of the best products that we stock. The stripes on every vest are highly reflective, but it’s useful to note that these aren’t ANSI level products. 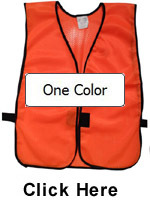 Click the button below to add the Economy Soft Mesh Safety Vests with Stripes (All Colors) to your wish list.